"Her opponent is taller, heavier and stronger, as well as outfitted in actual armor. By all rights, he should be the victor..."
The She-Devil with a Sword made a name for herself by fighting the good fight. She's a formidable opponent who many have fallen to, despite their notions that she will readily roll over in fighting. It all makes for a great legend, but what happens when the legend gets older? 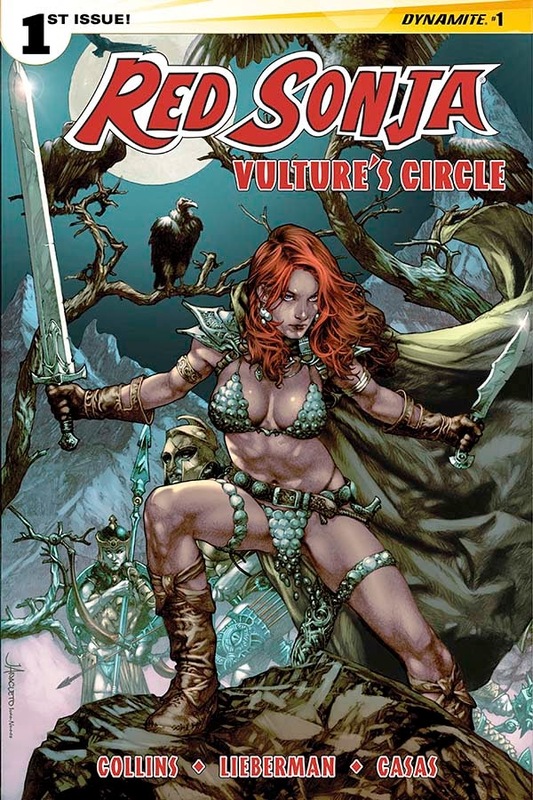 Things get a little tougher in Red Sonja: Vulture's Circle #1 from Dynamite Entertainment. The issue is written by Nancy A. Collins and Luke Lieberman, illustrated by Fritz Casas, colored by Adriano Augusto and lettered by Joshua Cozine. From shadow-haunted Stygia emerges an evil undreamt of by even the most depraved minds: the demi-god called Sutekh. 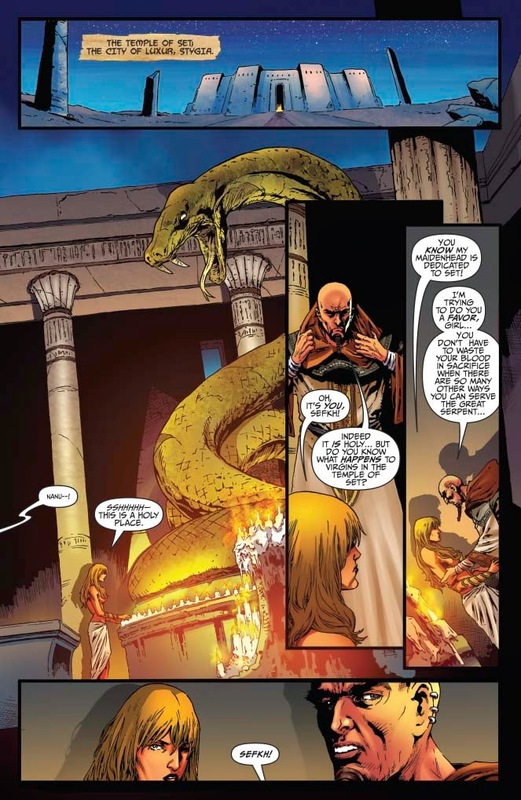 Born of an unspeakable blood ritual, he is the half-human progeny of the ancient serpent-god Set, sent forth to enslave mankind in the name of his father and return the world to a primordial swamp. 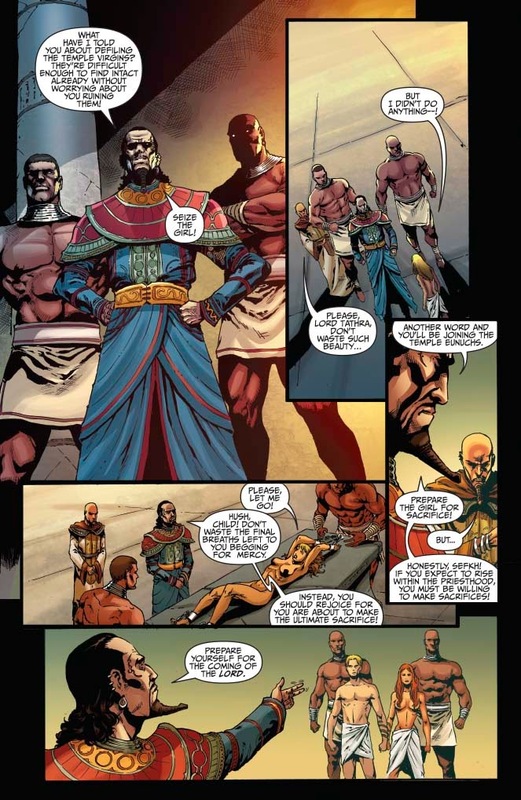 The new-born Sutekh leads a fearful army and uses powerful sorcery and a menagerie of demonic war-beasts to break the will of his mortal enemies as he marches forth to conquer the kingdoms of the Hyborian Age, defeating foe after foe - until he crosses the path of an older, battle-scarred Red Sonja, who has exchanged the life of a mercenary for running a school for sword-maidens. Despite all their accomplishments, storied heroes eventually reach a point where the heroics aren't as easy as they used to be. This is where Red Sonja: Vulture's Circle #1 excels best, with Collins and Lieberman giving the reader a glimpse at a Red Sonja whose physically feeling the effects of all her travels. It's a pretty refreshing take on the character, as Red Sonja manages to maintain her ferocity, even if it comes at the expense of soreness and a general tiredness from age. 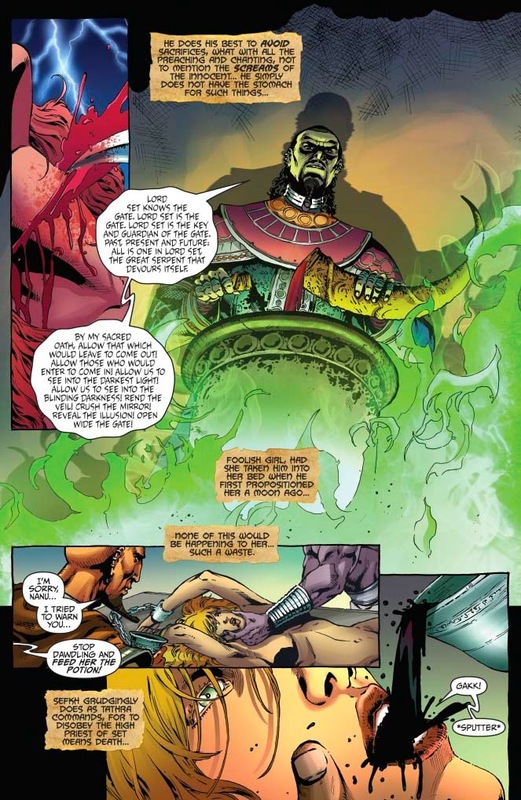 Collins and Lieberman still manage to make Red Sonja legitimately frightening to her opponents (even if her knee is acting up on her for instance) and it's nice to see her training other women to be fighters as well. The curiosity of her two prize students Lyla and Xoana draw her further into battle and it's looking like she'll need their raw talent to help save the day. 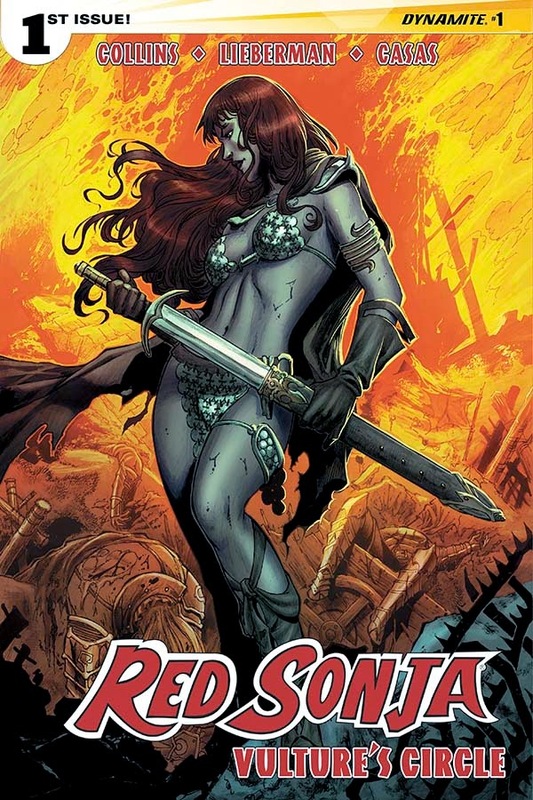 Red Sonja: Vulture's Circle #1 certainly doesn't hide from the fact that Red Sonja lives in a very dangerous world. Casas' presentation of a ritual sacrifice at the beginning is anything but polite, with the arrival of Sutekh heralded by blood and bodily harm. It's a little odd to see Red Sonja in something other than her usual battle outfit; still, Casas dresses her appropriately to lead to a school to train warriors and maintain a day-to-day routine. The panel layouts throughout the book are somewhat erratic, with all manner of insets and panels peppered here and there in a way that adds to the chaos of combat. 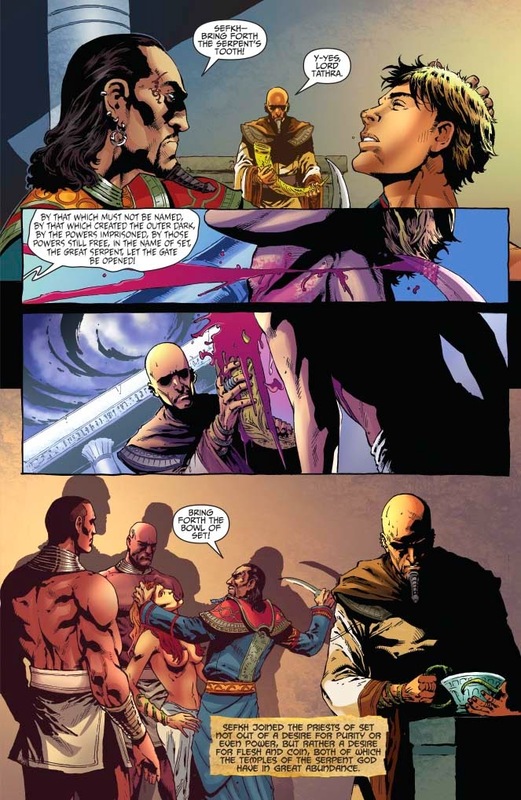 Many of the characters are emphasized by a lack of background, as Casas seemed to instead focus on them to carry the action. Red Sonja: Vulture's Circle #1 boasts a lot of what anyone familiar with Red Sonja is looking for: combat, violence and a hero who has an affinity for being a general badass. It's also got something a little unfamiliar in an older, less brash Red Sonja, who's dealing with the effects of time on her body. This departure by Collins and Lieberman offers a refreshing twist on an old favorite, giving Red Sonja an opponent she can't easily dispatch. Casas imbues the book with a look that readers will recognize, including a gorgeous two-page spread where a younger Red Sonja squares off against a much larger foe. All in all, Red Sonja: Vulture's Circle #1 is a pretty solid first issue that doesn't tread new ground necessarily, but does offer a twist in terms of Red Sonja's ability to deal with what comes next. Red Sonja: Vulture's Circle #1 is available now with interiors below.